Need your California driver license? Then you'll definitely need to find a CA DMV licensed driving school in your area to help you become a safe driver as well as meet your California DMV driver training requirements. The CA DMV has its own rules and regulations when it comes to driving schools and getting your driver license. DrivingLinks.com is committed to helping you find pertinent information that will help you choose a safe, reliable, and authorized California driving school. With all the CA driving schools out there, be sure you take your time when selecting the training that will keep you and your loved ones safe on California road for years to come. It's no secret that teen drivers have a higher rate of serious and deadly accidents than other drivers. Many of these accidents are caused by common mistakes, or an incomplete knowledge of California DMV traffic laws. With these poignant statistics, it's a wonder parents don't take choosing a CA driving school more seriously. The knowledge gained from a good, qualified, California DMV licensed driving school decreases the chances of being involved in a costly, injurious or possibly deadly collision. Living in Los Angeles County, Ventura County, or surrounding areas? Then LosAngelesDrivingSchool.com might be the right choice for you. They provide online drivers ed and in car driving lesson instruction for Los Angeles, Santa Clarita, Valencia, the San Fernando Valley, the Conejo Valley, Burbank, Beverly Hills, Santa Monica, and Hollywood! Do you live in the South Bay region of California? Southbay-Driving-School.com is the newest driving school website dedicated to teen drivers needing a drivers license or permit in South Bay, CA. They offer driving school behind-the-wheel lessons to any high school student living in Torrance, Redondo Beach, Manhattan Beach, Palos Verdes Estates, El Segundo, Hermosa Beach, and Rancho Palos Verdes. They also offer a discounted driving school course. In addition, they have an online drivers education course that is DMV approved, fun, easy, and fulfills your entire drivers ed course requirement. When choosing the right California driving school for you or your loved ones, there are some obvious and not-so-obvious points to consider. � Verify the driving school is licensed by your CA DMV. � Customer service should be a priority for Driving Schools. � Choose a driving school with nothing to hide. 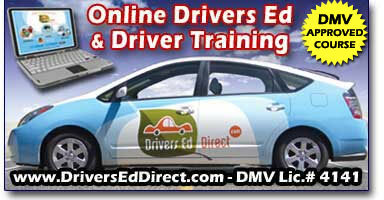 � Find a driving school with several products to offer. � Driving schools should be able to help get your California learner's permit. � Review the driving school's website. � Make sure the driving school's instructors are capable. � What does the driving school offer in the way of training vehicles? � Verify basic driving school services are intact. � Make sure they can accommodate your schedule. � Is the Driving School involved with a community in California? As you can see, choosing a suitable driving school requires a little more forethought than opening up the yellow pages and randomly dialing a phone number. While many teens may opt to take the quickest and easiest route they can find, a prudent parent knows that this is not a decision that should be rushed. For more complete information regarding choosing a driving school, read this highly rated article that sets the record straight.